CareTek can help you enhance business productivity and facilitate agility by creating a unified workspace encompassing every combination of applications, devices, networks and operating systems. Our network and security team provides you with customized, fine-tuned, secure IP telephony and help you unite your organization’s many locations and employees into a single converged network. IP also offers cost savings by combining voice and data on one network that can be centrally maintained and by eliminating tolls for calls between locations. At CareTek we design, operate and provide professional services on email and collaboration platforms like Microsoft Exchange, IBM Lotus Notes. Collaboration Services. It comprises of enterprise wide MS SharePoint/Lotus notes, Instant messaging implementation and support. 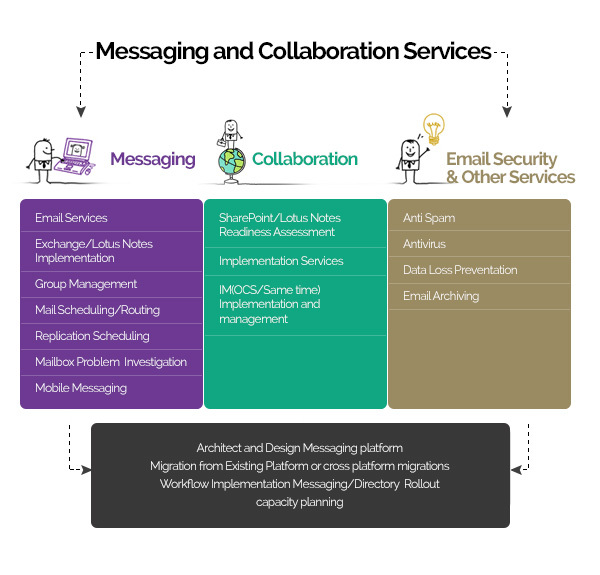 Hosted Messaging Solution CareTek offers hosted messaging solutions to our customers where CareTek owns the entire messaging stack right from Hosting & Hardware to Operations & Maintenance. These services are offered to the customer on a per mailbox model.